Publications | Xiuquan (Xander) Wang, Ph.D., P.Eng. 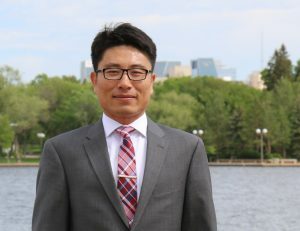 Xiuquan (Xander) Wang, Ph.D., P.Eng. Cai, B., X. Wang, G. Huang, J. Wang, D. Cao, B. W. Baetz, L. Liu, H. Zhang, A. Fenech, and Z. Liu (2018). Spatiotemporal Changes of China’s Carbon Emissions. Geophysical Research Letters (American Geophysical Union), 45(16):8536-8546. doi:10.1029/2018GL079564. Zhu, J., G. Huang, B. Baetz, X. Wang, and G. Cheng (2018). Climate Warming Will Not Decrease Perceived Low-Temperature Extremes in China. Climate Dynamics (Springer). doi:10.1007/s00382-018-4469-8. Zhou, X., G. Huang, X. Wang, and G. Cheng (2018). Future Changes in Precipitation Extremes over Canada: Driving Factors and Inherent Mechanism. Journal of Geophysical Research: Atmospheres (American Geophysical Union), 123(11):5783-5803. doi:10.1029/2017JD027735. Guo, J., G. Huang, X. Wang, Y. Li, and L. Yang (2018). Future Changes in Precipitation Extremes over China Projected by a Regional Climate Model Ensemble. Atmospheric Environment (Elsevier), 188:142-156. doi:10.1016/j.atmosenv.2018.06.026. Song, T., G. Huang, X. Zhou, and X. Wang (2018). An Inexact Two-Stage Fractional Energy Systems Planning Model. Energy (Elsevier), 160:275-289. doi:10.1016/j.energy.2018.06.158. Zhai, Y., G. Huang, X. Wang, X. Zhou, C. Lu, and Z. Li (2018). Future Projections of Temperature Changes in Ottawa, Canada through Stepwise Clustered Downscaling of Multiple GCMs under RCPs. Climate Dynamics (Springer). doi:10.1007/s00382-018-4340-y. Zhou, X., G. Huang, B. W. Baetz, X. Wang, and G. Cheng (2018). PRECIS-Projected Increases in Temperature and Precipitation over Canada. Quarterly Journal of the Royal Meteorological Society (Royal Meteorological Society), 144(711):588-603. doi:10.1002/qj.3231. Guo, J., G. Huang, X. Wang, Y. Li, and Q. Lin (2018). Dynamically-Downscaled Projections of Changes in Temperature Extremes over China. Climate Dynamics (Springer), 50(3-4):1045-1066. doi:10.1007/s00382-017-3660-7. Zhou, X., G. Huang, X. Wang, and G. Cheng (2018). Dynamically-Downscaled Temperature and Precipitation Changes over Saskatchewan Using the PRECIS Model. Climate Dynamics (Springer), 50(3-4):1321-1334. doi:10.1007/s00382-017-3687-9. Wang, L., G. Huang, X. Wang, and H. Zhu (2018). Risk-Based Electric Power System Planning for Climate Change Mitigation through Multi-Stage Joint-Probabilistic Left-Hand-Side Chance-Constrained Fractional Programming: A Canadian Case Study. Renewable & Sustainable Energy Reviews (Elsevier), 82(1):1056-1067. doi:10.1016/j.rser.2017.09.098. Wang, X., G. Huang, B. W. Baetz, and S. Zhao (2017). Probabilistic Projections of Regional Climatic Changes over the Great Lakes Basin. Climate Dynamics (Springer), 49(7-8):2237-2247. doi:10.1007/s00382-016-3450-7. Zhou, X., G. Huang, X. Wang, Y. Fan, and G. Cheng (2017). A Coupled Dynamical-Copula Downscaling Approach for Temperature Projections over the Canadian Prairies. Climate Dynamics (Springer). doi:10.1007/s00382-017-4020-3. Zhu, J., G. Huang, X. Wang, and G. Cheng (2017). Investigation of Changes in Extreme Temperature and Humidity over China through a Dynamical Downscaling Approach. Earth’s Future (American Geophysical Union), 5(11):1136-1155. doi:10.1002/2017EF000678. Guo, J., G. Huang, X. Wang, Y. Li, and Q. Lin (2017). Investigating Future Precipitation Changes over China through a High-Resolution Regional Climate Model Ensemble. Earth’s Future (American Geophysical Union), 5(3):285-303. doi:10.1002/2016EF000433. Zeng, X., Y. Zhu, C. Chen, Y. Tong, Y. Li, G. Huang, S. Nie, and X. Wang (2017). A Production-Emission Nexus Based Stochastic-Fuzzy Model for Identiﬁcation of Urban Industry-Environment Policy under Uncertainty. Journal of Cleaner Production (Elsevier), 154:61-82. doi:10.1016/j.jclepro.2017.03.137. Fan, Y., G. Huang, Y. Li, X. Wang, Z. Li, and L. Jin (2017). Development of PCA-based Cluster Quantile Regression (PCA-CQR) Framework for Streamflow Prediction: Application to the Xiangxi River Watershed, China. Applied Soft Computing (Elsevier), 51:280-293. doi:10.1016/j.asoc.2016.11.039. Zhang, Y., G. Huang, X. Wang, and Z. Liu (2017). Observed Changes in Temperature Extremes for the Beijing-Tianjin-Hebei Region of China. Meteorological Applications (Royal Meteorological Society), 24(1):74-83. doi:10.1002/met.1606. Li, Z., G. Huang, X. Wang, J. Han, and Y. Fan (2016). Impacts of Future Climate Change on River Discharge Based on Hydrological Inference: A Case Study of the Grand River Watershed in Ontario, Canada. Science of the Total Environment (Elsevier), 548-549:198-210. doi:10.1016/j.scitotenv.2016.01.002. Wang, X., G. Huang, J. Liu, Z. Li, and S. Zhao (2016). GIS-Based Data Portal for Climate Change Impact Assessment. Bulletin of the American Meteorological Society (American Meteorological Society), 97: 17-18. Fan, Y., G. Huang, Y. Li, X. Wang, and Z. Li (2016). Probabilistic Prediction for Monthly Streamflow through Coupling Stepwise Cluster Analysis and Quantile Regression Methods. Water Resources Management (Springer), 30(14):5313-5331. doi:10.1007/s11269-016-1489-1. Zhao, S., G. Huang, S. Wang, X. Wang, and W. Huang (2016), Insight into Sorption Mechanism of Phenanthrene onto Gemini Modified Palygorskite Through a Multi-Level Fuzzy-Factorial Inference Approach, Journal of Environmental Science and Health, Part A. Toxic/Hazardous Substances and Environmental Engineering (Taylor & Francis), 51(9):759-768. doi:10.1080/10934529.2016.1170459. Wang, X., G. Huang, and B. W. Baetz (2016). Dynamically-Downscaled Probabilistic Projections of Precipitation Changes: A Canadian Case Study. Environmental Research (Elsevier), 148:86-101. doi:10.1016/j.envres.2016.03.019. Zhao, S., G. Huang, X. Wang, Y. Fan, and C. An (2016). Sorption of Phenanthrene onto Diatomite under the Influences of Solution Chemistry: A Study of Linear Sorption Based on Maximal Information Coefficient. Journal of Environmental Informatics (International Society for Environmental Information Sciences). doi:10.3808/jei.201600 329. Wang, X., G. Huang, and J. Liu (2016). Twenty-First Century Probabilistic Projections of Precipitation over Ontario, Canada through a Regional Climate Model Ensemble. Climate Dynamics (Springer), 46(11-12):3979-4001. doi:10.1007/s00382-015-2816-6. Zhuang, X., Y. Li, G. Huang, and X. Wang (2016). A Hybrid Factorial Stepwise-Cluster Analysis Method for Streamflow Simulation – A Case Study in Northwestern China. Hydrological Sciences Journal (International Association of Hydrological Sciences), 61(15):2775-2788. doi:10.1080/02626667.2015.1125482. Wang, X., G. Huang, J. Liu, Z, Li, and S. Zhao (2015). Ensemble Projections of Regional Climatic Changes over Ontario, Canada. Journal of Climate (American Meteorological Society), 28:7327-7346. doi:10.1175/JCLI-D-15-0185.1. Li, Z., G. Huang, J. Han, X. Wang, Y. Fan, G. Cheng, H. Zhang, and W. Huang (2015). Development of a Stepwise-Clustered Hydrological Inference Model. Journal of Hydrologic Engineering (American Society of Civil Engineers), 20(10):04015008. doi:10.1061/(ASCE)HE.1943-5584.0001165. Wang, X., G. Huang, Q. Lin, X. Nie, and J. Liu (2015). High-Resolution Temperature and Precipitation Projections over Ontario, Canada: A Coupled Dynamical-Statistical Approach. Quarterly Journal of the Royal Meteorological Society (Royal Meteorological Society), 141(689): 1137-1146. doi:10.1002/qj.2421. Fan, Y., W. Huang, G. Huang, Z. Li, Y. Li, X. Wang, G. Cheng, and L. Jin (2015). A Stepwise-Cluster Forecasting Approach for Monthly Streamflows Based on Climate Teleconnections. Stochastic Environmental Research and Risk Assessment (Springer), 29(6):1557-1569. doi:10.1007/s00477-015-1048-y. Wang, X., G. Huang, and J. Liu (2015). Projected Increases in Near-Surface Air Temperature over Ontario, Canada: A Regional Climate Modeling Approach. Climate Dynamics (Springer), 45(5-6):1381-1393. doi:10.1007/s00382-014-2387-y. Wang, X. and G. Huang (2015). Impacts Assessment of Air Emissions from Point Sources in Saskatchewan, Canada – A Spatial Analysis Approach. Environmental Progress & Sustainable Energy (American Institute of Chemical Engineers), 34:304-313. doi:10.1002/ep.11948. Wang, X., G. Huang, S. Zhao, and J. Guo (2015). An Open-Source Software Package for Multivariate Modeling and Clustering: Applications to Air Quality Management. Environmental Science and Pollution Research (Springer), 22(18):14220-14233. doi:10.1007/s11356-015-4664-7. Wang, X., G. Huang, Q. Lin, and J. Liu (2014). High-Resolution Probabilistic Projections of Temperature Changes over Ontario, Canada. Journal of Climate (American Meteorological Society), 27:5259-5284. doi:10.1175/JCLI-D-13-00717.1. Wang, X., G. Huang, and J. Liu (2014). Projected Increases in Intensity and Frequency of Rainfall Extremes Through a Regional Climate Modeling Approach. Journal of Geophysical Research: Atmospheres (American Geophysical Union), 119:13271-13286. doi:10.1002/2014JD022564. Wang, X. and G. Huang (2014). A Greenhouse Gas Baseline Emission Level Reporting System. International Journal of Performability Engineering (RAMS Consultants). 10(2): 230-234. Wang, X. and G. Huang (2014). Violation Analysis on Two-Step Method for Interval Linear Programming. Information Sciences (Elsevier), 281:85-96. doi:10.1016/j.ins.2014.05.019. Wang, X., G. Huang, Q. Lin, X. Nie, G. Cheng, Y. Fan, Z. Li, Y. Yao, and M. Suo (2013). A Stepwise Cluster Analysis Approach for Downscaled Climate Projection – A Canadian Case Study. Environmental Modelling & Software (Elsevier), 49:141-151. doi:10.1016/j.envsoft.2013.08.006. Jin, L., G. Huang, L. Wang, and X. Wang (2013). Robust Fully Fuzzy Programming with Fuzzy Set Ranking Method for Environmental Systems Planning Under Uncertainty. Environmental Engineering Science (Mary Ann Liebert Inc.), 30(6):280-293. doi:10.1089/ees.2012.0144. Wang, X., G. Huang, and Q. Lin (2012). An Interval Mixed-Integer Non-Linear Programming Model to Support Regional Electric Power Systems Planning with CO2 Capture and Storage under Uncertainty. Environmental Systems Research (Springer), 1(1):1-13. doi:10.1186/2193-2697-1-1.